Back in the summer holidays, my friend Zoe did a lovely family photoshoot for us. The photo she took of my girls having a cuddle is my favourite ever photo of them. It’s one that I’ve been meaning to have put on a canvas for a while. Needless to say, when www.My-Picture.co.uk offered me the chance to review one of their Photo Canvas Prints, I jumped at the chance. I opted for a 60cm x 40cm print because this fitted best with the dimensions of the photo. Ordering my photo canvas was a straightforward process. I simply uploaded the photo, chose my canvas size and entered my details. The canvas then arrived by courier delivery a few days later. You can see my first reaction to seeing my canvas, as well as my mum’s and Sophie’s reactions, in the video below. The canvas print is now on the wall above my computer and makes me smile every time I look at it. I’m happy with the quality of the print. The photo quality is good and the photo wraps around the edges of the canvas. The frame is made of spruce wood and the canvas is light enough to be held on the wall using a single screw. As well as canvas prints, www.My-Picture.co.uk offer a range of photo gifts, such as a Personalised Photo blanket or a cushion. You can also order prints on mugs, phone cases, mouse mats and puzzles. I’m currently offering all my readers a special promotion code on three, large-format canvas prints. Using the code LILHEARTSBIGLOVE, you can personalise your own 60x40cm (retail price £49.90), 75x50cm (retail price £59.90) and/or an 80x60cm (retail price £69.90) canvas print for only £20. 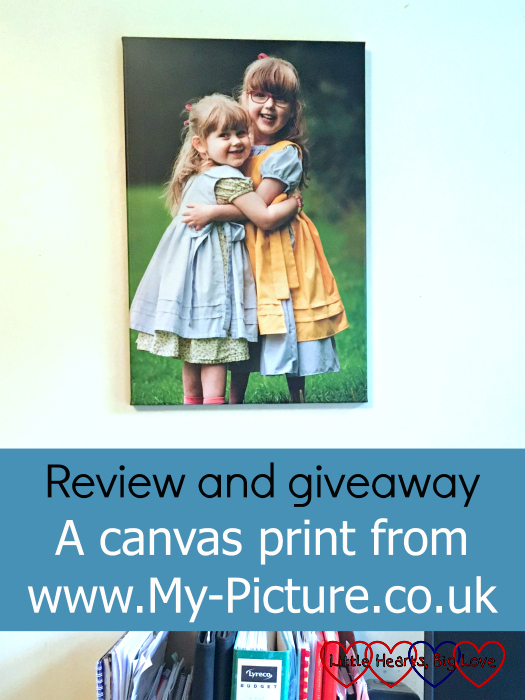 To obtain your canvas print at this discounted price, simply go to www.My-Picture.co.uk, upload your required image, select one of these formats and enter the voucher code LILHEARTSBIGLOVE in the shopping cart section. The promotional code is valid until 31 October 2017. I also have one 60cm x 40cm canvas photo print from www.My-Picture.co.uk to give away to one lucky reader. To be in with a chance to win, please enter through the Gleam form below. The competition is open to entrants from the UK only. The winner will be chosen at random after the competition closes at 23.59pm on 22nd October 2017. For full terms and conditions, please click the link on the Gleam widget. Good luck! I received a 60cm x 40cm canvas print to review for the purposes of this post. All thoughts and opinions are my own. Love the photo of the girls; it’s one that will always be a sweet remembrance.